StrawberryFrog has been tasked with developing a multimillion pound global Heineken campaign based on the brewers' relationship with the new James Bond film. 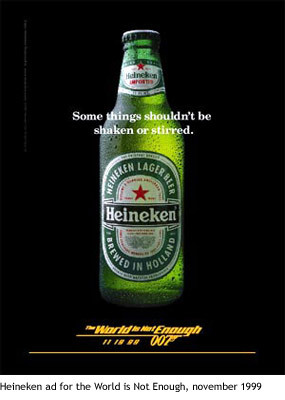 Heineken has long had an association with the 007 franchise and is a sponsor of the latest movie, Casino Royale. Previous Heineken involvement began with product placement in the film Tomorrow Never Dies in 1997. Heineken ran advertising alongside the film featuring the now deceased actor Desmond Llewelyn, who played inventor Q in the franchise. The print campaign carried the strapline "Some things should be shaken, not stirred." The recent Bond-related campaigns were developed by Wieden & Kennedy Amsterdam. However, Strawberry Frog was appointed to the brewer's account last August following a final pitch against McCann Erickson, London. The brewer did state last year that it was moving spend out of television and into alternative forms of marketing.